Overnight oats are a breakfast game changer! 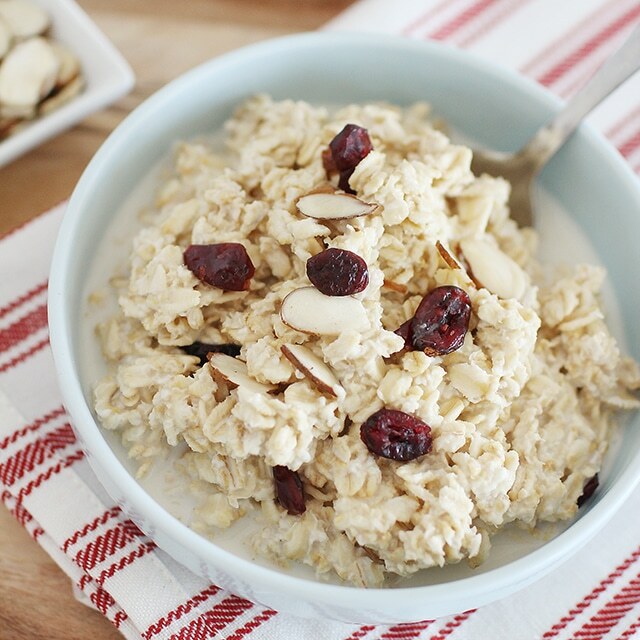 We love how simple, filling and delicious eating oatmeal can be! This post was originally written almost 10 years ago, and I had titled it “Swiss Meusli”. This was BEFORE overnight oats started trending online as a breakfast idea. Originally developed in the early 1900’s as a healing food for patients in a Swiss hospital, Muesli is now eaten in Switzerland as an evening dish. While I originally grew up calling this breakfast Muesli, overnight oats makes a great breakfast food for those who love the filling nature of a grain based breakfast. It’s made by soaking oats or other grains and keeping it in the fridge for several hours or overnight so the liquid absorbs into the grains. If you can remember to prepare this the night before, it makes a quick, easy, and healthy breakfast for busy mornings- without the mess! 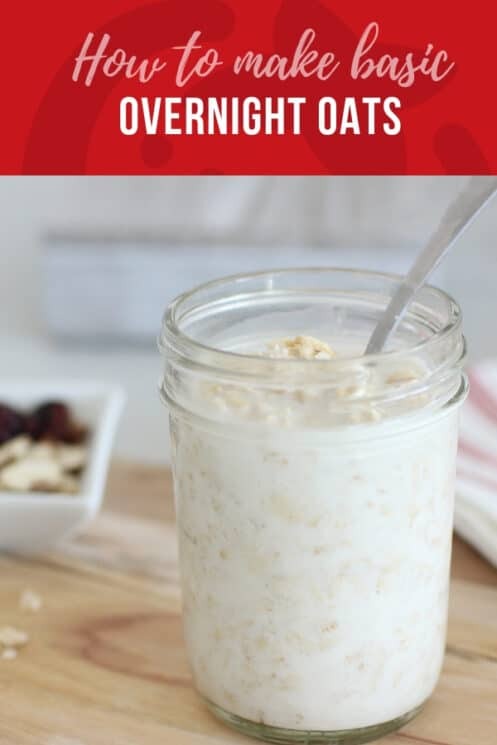 Overnight oats is a way to prepare oatmeal for breakfast that changes the texture and flavor of regular cooked oatmeal. 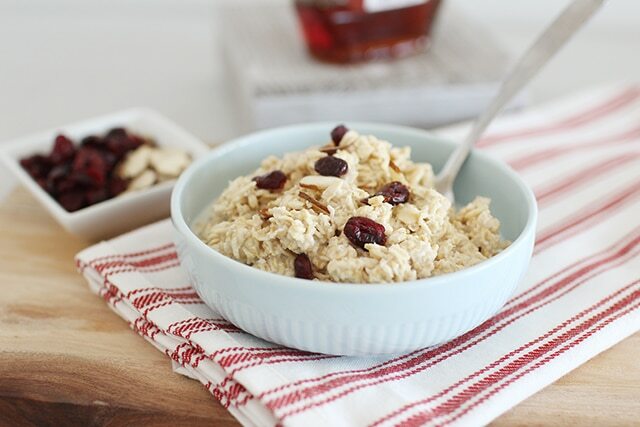 Simply combine uncooked oats with a liquid, and any other add-ins you desire, and leave in the refrigerator overnight to allow the liquid to absorb into the oats. In the morning, these oats do not need to be cooked. Just stirred and eaten! This has become increasingly popular in the last few years. 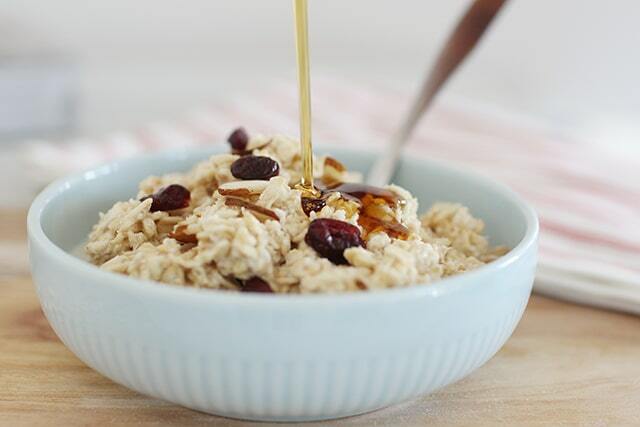 Soaked oats are easily digestible, and more appealing for kids who don’t like the texture of cooked oats. I recently bought 25 lbs of oats for $7.50. Definitely a cheap meal. You can use any type of oats. Rolled oats, steel cut oats, oat groats, or quick oats. Any liquid can be added. Popular liquids include milk, almond milk, coconut milk, yogurt, or even juice. I like honey, but you could also use maple syrup, agave, organic brown sugar, date sugars, or nothing at all! Fresh fruit like apple slices, grapes, melons, berries, bananas, etc. are delicious in overnight oats. You can add dry raisins, apricots, bananas, dates. We usually add chopped pecans. But walnuts and almonds are also fabulous! Put oats, liquid, and sweetener combined in fridge overnight. Add nuts and fruit in the morning. Are you supposed to eat overnight oats cold? Yes!! This question comes up a lot because we are so conditioned to think of oats as only a hot cereal option. But eating them cold after they are soaked is why overnight oats are different enough for kids to try it who aren’t fans of hot oatmeal. However, you can also heat up overnight oats and eat them warm as well. What should you store overnight oats in? Many people choose to store overnight oats in glass jars. This is a great way to keep them. Mason jars are inexpensive, portable, and you can stack them on your refrigerator door and it won’t take up much space. However, any lidded container will do. Keeping it air tight helps keep the oats soft and moist, and prevents them from drying out, which will happen very quickly if you don’t keep it covered. Well, I’m going to try this. I only have 1 oatmeal eater, but I would love for the other two to eat this. It’s worth a shot! Sorry, forgot to ask….do you eat this cold or heat it up? We eat our Museli raw without any soaking overnight. I keep a big jar readymade on the counter. We just add milk and fruit in the morning. We also throw our mix into yogurt, etc. On really cold days, I put the milk in and then heat it in the microwave. I love museli soaked or un-soaked. But the soaked variety I know as Bircher Museli and we add grated apple (or apple snow as its known in our house), dried fruits and almonds too. DELISH!!! If I kept a jar of ready made, could I add the raisens or other dried fruit to the dry oatmeal? Would that keep ok in ziplocks or jars? Then just add milk? Too funny! I love that your toddler likes oatmeal despite your aversion. I get these type of questions a lot about how long will things last. They are super hard for me to answer, because my family eats so much, we seldom have leftovers. However, from what I hear, it will last as long as your milk or yogurt would expire by. If your milk expires Friday, I’d eat the muesli by Friday, etc. I’d say for best flavor, use within 3-5 days. 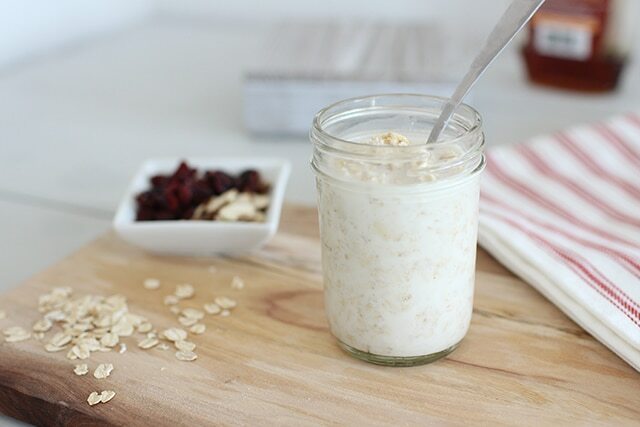 Yes, you could keep the dry oatmeal in jars or bags, and add milk the night before! We tried it this morning. Loved that I could make it the night before and just toss fruit in the morning. So far myself, my husband, and my one year old likes it … we’ll see when my three year old wakes up :). Update – the milkie monster approved so our family is now 4 for 4 liking the Swiss Muesli. I’m sold. Off to the cannery I go for the inexpensive oats. We made it with Tillamook French Vanilla yogurt and raisins. Thanks for the great recipes! The two bean corn bread dish is in my oven right now. We add freshly grated coconut and date syrup (we live in the Middle East) and raisins. Fresh fruit gets added in the morning.